The Sprungbrett artists Bahar Gökten, Viola Luise Barner and Lin Verleger made intensive use of the research weeks in the tanzhaus nrw and at PACT Zollverein to explore, get to know and approach, analyse, recreate and research their respective techniques and styles of urban dance. Under the title # URBAN PARTNERING #, the three dancers with a common basis in urban dance and especially in breaking are researching partner work in urban dance: "Inspired by partnering in contemporary dance and by our foundation in urban dance, we are interested in exploring, developing and finding a structure for movement concepts on stage. A structure that promotes a real simultaneous and momentary exchange". They would like to discover what their three different experiences and movement languages produce: What influence does Viola bring from Capoeira? How does Bahar use isolated popping movements and how energetically do Lin's Powermoves contribute to the dynamics of the movements? Viola Luise Barner studied dance at the Salvador State University in Brazil. With a focus on urban dance styles, contemporary dance and capoeira, she has been a guest on international stages in Costa Rica, Brazil, Colombia and Germany as a member of various companies. Viola choreographs and directs children's and youth projects, is active in various dance collectives and founded the wildmindflowers collective with other dancers. Lin Verleger's work with a style of breaking and contemporary dance has taken him to Spain, Mauritius, Poland and Great Britain. He won the German Breakdance Championships and has concentrated on dance theatre since 2010, working with Regina Advento, La Macana, Susanne Linke and Morgan Nardi. In 2015 Lin was awarded the Prize for Staging, Movement and Design by the German Sport University Cologne for his choreographic production Stüttgerhofweg 15. He is currently studying sports science with a focus on dance at the German Sport University Cologne. Bahar Gökten is a dancer with Renegade and with the breaking group Dirty Mamas Crew. Together with five other choreographers, she founded the urban dance collective nutrospektif in 2012, with which she creates her own stage plays and interdisciplinary improvisation formats, also for young audiences. Bahar's work has taken her to the Staatstheater Stuttgart, the Théâtre de Suresnes and the Deutsche Oper am Rhein. In addition to her studies in educational science, she initiates projects for children and young people. 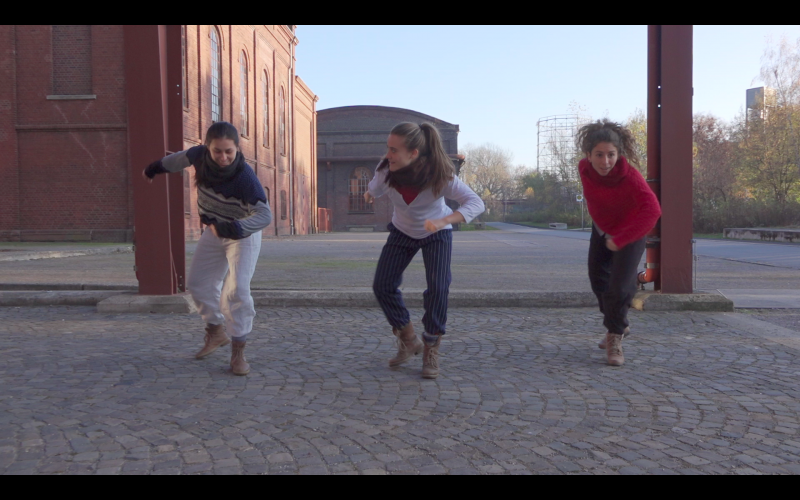 The second group, consisting of Greta Salgado Kudrass, Constanza Ruiz Campusano and Amanda Romero Canepa, got to know the original Tinku dance with invited guest artists at PACT Zollverein and learned to practice it themselves. The dancers' research focus is on the exploration of dance and body traditions in a specific cultural context. Up to now, they have focused on rituals and folkloric dances in Latin America. "From a dramaturgical point of view, in order to develop dance research, we believe that this topic has great potential, since it is essentially a physical tradition, of physical confrontation and of which a folkloric dance is born," they explain their research project. In February they travel to Bolivia to participate in the carnival and to research and practice the Tinku dances on location. They will take these new experiences with them for the second part of their research in April in the tanzhaus nrw. Amanda Romero Canepa started dancing in her hometown Lima and studied contemporary dance at the Centre for Contemporary Dance at the Hochschule für Musik und Tanz in Cologne until 2017. She worked with the choreographers Rafaële Giovanola, Emanuel Gat and Martin Sonderkamp, among others, and also realised interdisciplinary projects with musicians and visual artists. Her work also focuses on social-artistic projects with dancers who focus on Latin American culture. Greta Salgado Kudrass came to Cologne from South America in 2013 to study at the Centre for Contemporary Dance at the Hochschule für Musik und Tanz Bühnentanz. She then created her own pieces such as her solo Solving Torsion Alone on aggressivity and collaborated with CocoonDance Company. Greta has already conducted research with Amanda Romero Canepa in the residence programme of TanzFaktur Köln. She is fascinated by the question of what can be communicated through dance and movement in a direct way. Constanza Ruiz Campusano, born and raised in Chile, completed her first bachelor's degree in sociology in 2009, which influenced her interest in dance: How do movement and body act in everyday life and in relation to different cultural contexts? She also studied at the Center for Contemporary Dance at the Hochschule für Musik und Tanz in Cologne and her thesis focuses on the Argentinean carnival murgatory dance. In 2015, she collaborated with Silke Schuster and Sanaz Startcic on the multimedia performance SALT, which is based on the idea of routine processes. As a performer, Constanza is fascinated by the exploration of physicality. SPRUNGBRETT < > TANZRECHERCHE NRW, a cooperative project of tanz nrw 19 and NRW KULTURsekretariat.